So last month I traded in my Range Rover for a Nissan Leaf. No really. I’ve been driving SUV’s for more than 7 years, but in 2013 I had my first test drive in an electric car and it’s been on my mind ever since. This isn’t something I’ve decided to do on a whim. In order for our family to try living with an EV one of our cars had to go. With a small petrol saloon and a 3 ton 4.4L V8 diesel in the garage, in one way it wasn’t a hard decision to make. In another way of course it was. Giving up the comfort, equipment and the high driving position in particular will be difficult as I go back to sitting in a lower, smaller car. There’s no nice way to put it, the Leaf has a face only a mother could love. The shape of those front headlights is functional, managing the airflow around the bodywork. But Tesla can make an aero efficient car that’s beautiful too. It seems well built (in Sunderland) and does have personality. It’s bigger than it looks, can take 5 adults and has a decent sized boot too. My better half had only one stipulation about the new car, it had to have heated seats. That meant going for the Tekna model which comes with some other upgrades like a Bose sound system, 360 degree external camera setup and a leather interior, vegans need not apply. Getting the car enrolled on the ironically named ‘Nissan Connect’ system was painful. It took several days to get the app paired with our Leaf and there was even an excursion under the bonnet for a serial number engraved on the motor at the request of the support staff. It was disappointing after the excellent experience we had with the salesman at the Belfast dealership. When we finally got the car connected we received an email confirmation which contained an incorrect URL that lead to even more head scratching and lost time too. 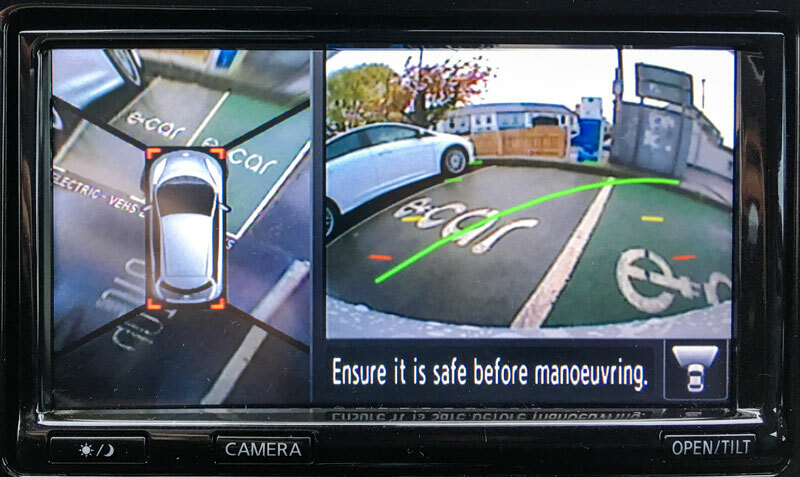 I tried hard to get someone in Nissan to allow me to share my experience and suggestions and save others from going through the same pain (some have even given up). But despite tweets emails and online chats I got nowhere. The web interface to the car is slow and poorly designed. The app is no better, although there are more contemporary interfaces from third party apps like EVA for iOS and Leaf Manager for Android. You can check on the state of charge and start the Climate Control remotely with the apps. 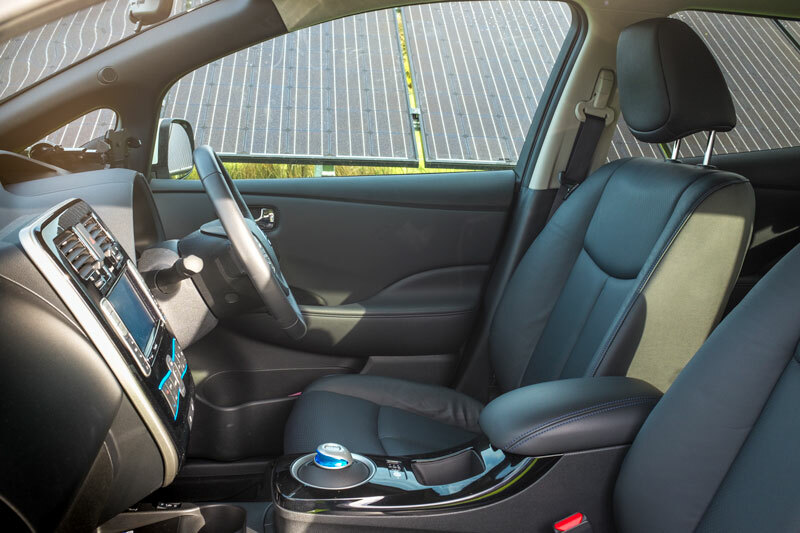 Usefully the on-board timer can schedule the car to pre-heat the cabin for you each morning while still connected to the mains. The cabin is a nice place to be and that wonderfully weird and eerie silence as you back out of the garage each morning never gets old. That sound, or lack of it, is something that’s often overlooked with an EV, but it makes it such a pleasant experience, one that you really appreciate once you go back to a regular car. The lack of vibrations, right from the starter motor on, really does make a difference. My better half will take the Leaf at any opportunity over the petrol car. And that’s not just because she doesn’t have to fuel it, she genuinely prefers its quiet, smooth drive too. Once you’re behind the wheel, using the Eco mode dulls the acceleration for the most economical driving. Pressing the throttle flat finds a button on the floor that allows you to easily over-ride it and temporarily access full power if required. It feels pleasantly torquey and is decently quick 0-30 and you can easily invoke the traction control on a damp road. Of course it’s not the sort of car for hooning around in. The new challenge is to max out your economy. There are various features to help you monitor your driving style, score your technique and gamify the whole experience. The dash is a confusing, cluttered and inconsistent design from the school of more is more. You grow little trees on the top display, the more economically you drive, the more trees you grow. 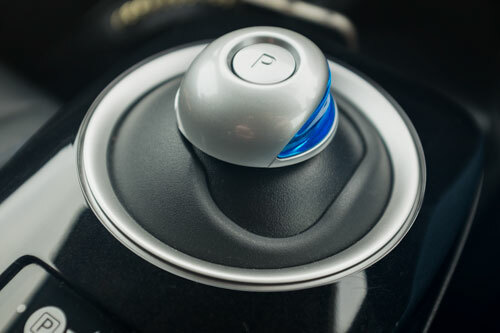 Flicking the ‘gear lever’ down into Drive a second time switches the car into Brake Mode. This increases braking regen and recuperates more energy, allowing you to one-pedal drive, only needing to touch the brake pedal when coming to a complete stop. The web interface provides (slow) access to all this data and rates your driving too. 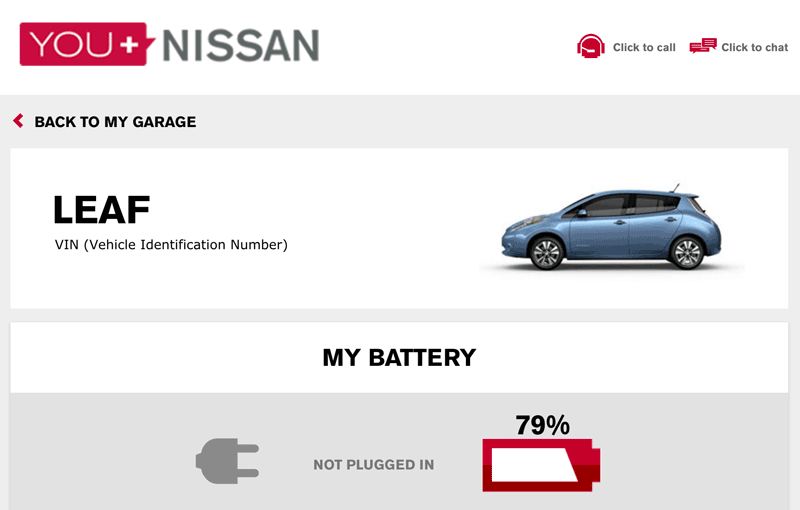 Here’s a summary from the web interface after around 10 days of driving the Leaf. 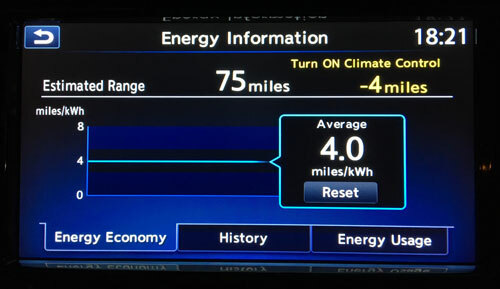 I think if everyone had an EV for a week it would give them a great insight into how to drive much more economically. Back in the petrol car I found myself frowning at all that energy I was throwing away on motorways off ramps and down hills. 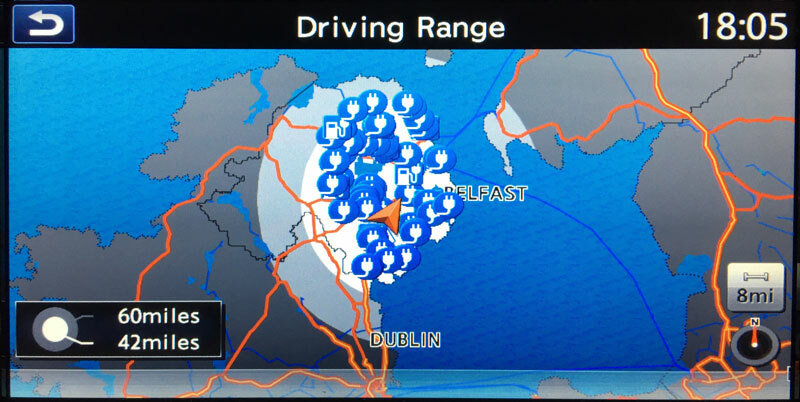 Even though its real world range is only around 85 miles, we can reach pretty much any part of Northern Ireland in the 24kWh Leaf, even without a full battery (check out the range map below with the car at around 65% charge). Both my wife and I averaged around 20 miles per day last year so 85 is more than enough for 99% of our journeys. And unlike a petrol or diesel car you leave the house every morning with a full ‘tank’. We have several Rapid chargers around us that can bring the EV to 80% in just 30 minutes. Type 2 chargers are much slower but so far we’ve not needed them. We did try the one in the photo below out of curiosity during a recent weekend away to the coast. Our destination was around 80 miles from home and although we could just about have made it we took a 20min Rapid charge on the motorway services. Check out plugshare.com for a look at the chargers available in your area. As an absolute last resort there’s a 3 year recovery service with the car that will put you on a flat bed and take you to your nearest charger should you get into trouble. We’ve met the nicest people at public chargers, an interesting bunch that are friendly and helpful. So far we’ve not been ICE’d and all chargers we visited bar-one have been in working order. There does seem to be a serious issue with some public chargers being out of order for long periods though. Also some are in car parks that are locked at night which seems really stupid, especially as many were installed with the help of public money. They should all be accessible 24/7. For the 1% of trips that are further afield we have the petrol car to fall back on. 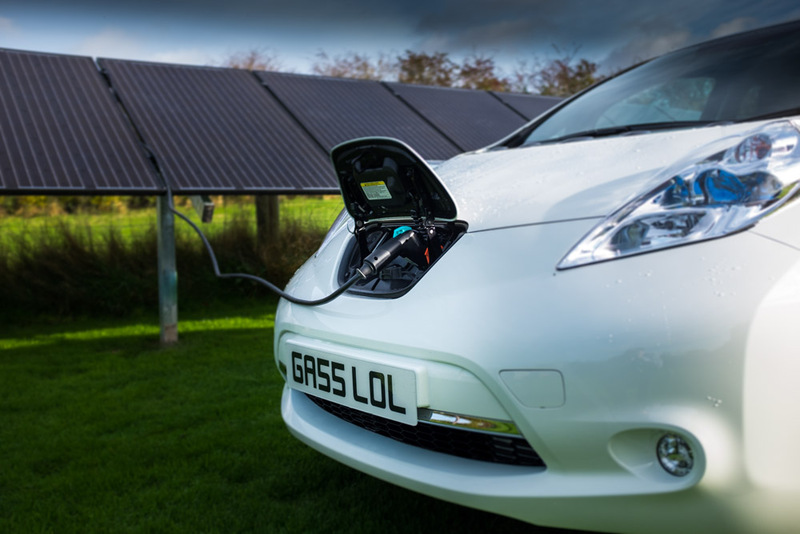 In addition Nissan will lend you a fossil powered car for up to 2 weeks a year at no charge (you’ll need to swap your own insurance onto the vehicle for the duration). 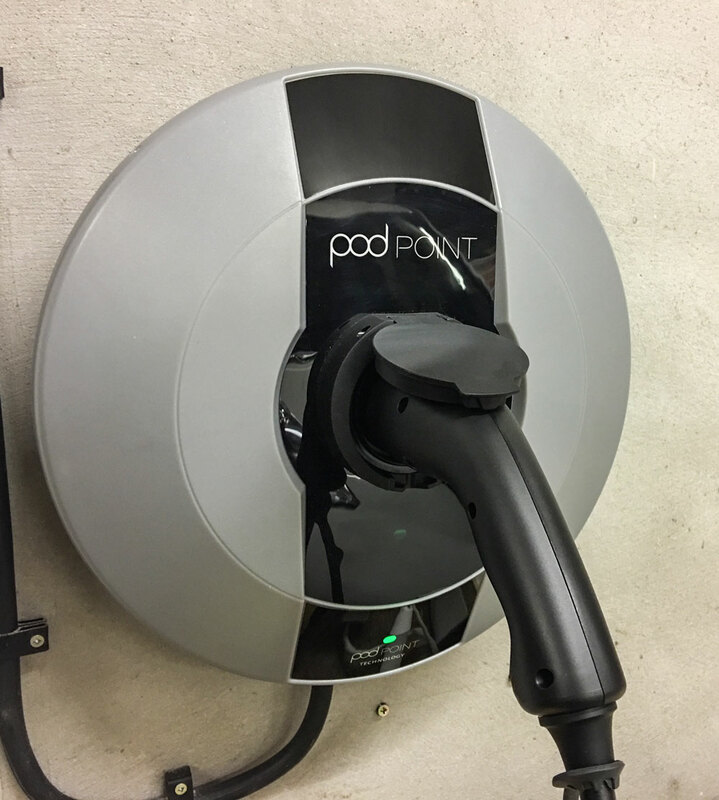 The Electric Vehicle Homecharge Scheme / OLEV gave us a £500 government grant and our PCP deal with Nissan qualified us for the rest of the money (£390) to fit a free 16amp Pod Point charger in our garage. More accurately these are special power outlets as the charger is actually in the car. Even though our Leaf doesn’t have the faster 6.6kW charger on board, we wanted to future proof the grant-aided home installation as much as possible so we paid £95 to upgrade to the 32amp / 7kW version. A grand (on paper at least) for this charger seems way over priced. A quick look on eBay shows 16amp chargers available for under £200 and the simple install took less than 2 hours. Is someone making a killing from this gov scheme? 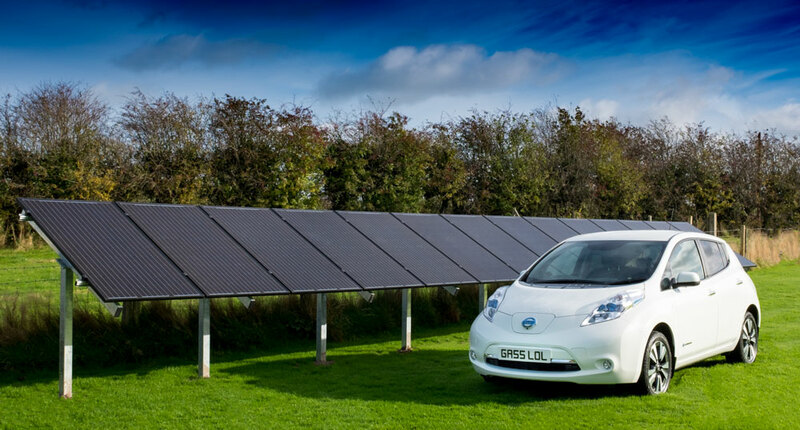 We’re looking forward to charging the Leaf from our solar array. While a 4kW system in Northern Europe is unlikely to ever provide enough surplus power for even the lowest mileage users, it should be able to contribute something over the brighter months of the year. That will rely on us charging fairly slowly though so as not to be pulling in power from the grid. We will have to use the 13amp 3-pin ‘granny’ charger to limit the rate. So where does the electricity for your fancy electric car really come from then? It’s a fair question. This table from our latest electricity bill shows the source of our electrons (using 2014 data). It may be a surprise to see that the largest contributor is Renewable (wind) energy at 36%. For EVs to make the most sense though we need to push that much higher – dirty coal is still third at 25%. But with the current trend, the EV you buy today will get cleaner over time. Even if the BEV was powered completely by electricity generated from fossil fuels, it would still be a huge improvement over an ICE car though. The internal combustion engine is around 20% efficient compared to more than 80% for an electric motor. But lets take a more comparable smaller ICE car that can average say 40mpg. The Leaf will still go 4 to 5 times further with the same amount of energy, whilst moving all those toxic fumes out of our towns and cities. Even though there’s currently plenty of spare generation capacity on the national grid at night, if we all changed to EV’s tomorrow it would be in big trouble. Last week Elon Musk said that globally we need 3 times the current level of generation to move to an all electric economy. We’re in a period of transition and we need to ramp up sustainable energy and transportation technologies. Sure there are environmental costs in building all these new things, but unless we’re all going to be huddled in caves wearing animal fur again we need to find a way to balance our modern way of life whilst reducing our consumption. At the same time this blog brings you shiny new products every week to covet and that irony is not lost on me. The environmental benefits of EVs include the potential for fewer cars on the roads in the future too. Rather than your second largest purchase sitting idle for 90% of its life, it could be working for you. Alternatively you may just end up with a subscription for a car in the future (CaaS – Car as a Service? ), summoning an autonomous vehicle from an app when you need it. Check out the video below in this weeks homework section on the science behind the autonomous self-driving cars that are only perhaps a year away (the tech will be here by then, if not the legislation). A side-effect of our EV experiment is the reduced costs of our family transport. This 24kWh Leaf is basically a run out model, due to be discontinued in favour of the existing and larger 30kW model very soon. Additionally, the announcement of the completely new generation Leaf is due any day now to replace the current ageing design thats been around since 2010. All that means there are some great deals around. The £4,500 Plug-In Car Grant from the government helps the lease company so our 3 year x 8,000 mile PCP payments don’t even come close to paying just the depreciation on the car. £500 saved on road tax – £0 road tax for Leaf versus £500 for the Range Rover. £1,300 on fuel – We’re averaging an indicated 4.0 miles per kWh so far, that works out at a little over £0.03 per mile vs around £0.19 per mile for the SUV. Those savings are calculated on electricity vs diesel over 8,000 miles annually and ignores the potential for home Solar charging and (still free, but not for long) public chargers in Northern Ireland. £350 saved on insurance – Unsurprisingly the Leaf is much cheaper to insure than the RR. 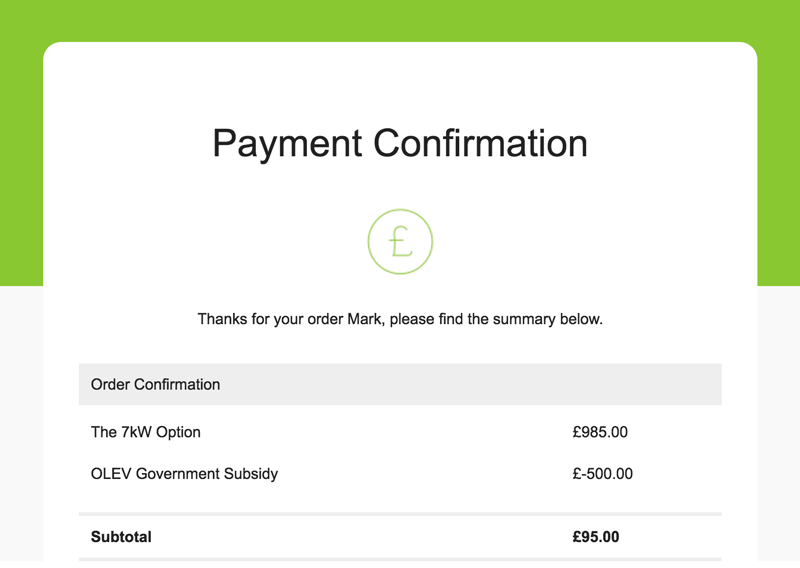 BIK – If you’re lucky enough to get a company car (I’m not) then an EV will provide the lowest benefit in kind rate. I talked to a friend the other day who told me he’d effectively given himself a £2K pay rise by moving to an EV. We’re only 3 years away from the decade of change over to the EV according to Bloomberg. The time when an electric car will be the same price as an ICE powered one, range will be high enough to no longer matter and running costs will still be hugely advantageous. The time when buying the ICE car over the EV will be the strange decision, not the other way around. As electric cars start to become the norm, the model choice will increase from the relatively small offering available today. Who knows, I could be sitting high up again but in an EV, or maybe I’ll stick with being closer to the ground. So there it is, it’s early days in our EV experiment, but so far so good. What do you call the opposite of a mid-life crisis? A mid-life cognisance? Maybe. I’m all in. Next time I measure every electrical device in the Automated Home trying to reduce our baseline. In the meantime here’s a couple more interesting videos to check out. Full disclosure: I actually got a private buyer for the range rover between the time we agreed the deal with Nissan and the new Leaf was delivered, so technically I didn’t ‘trade it in’. 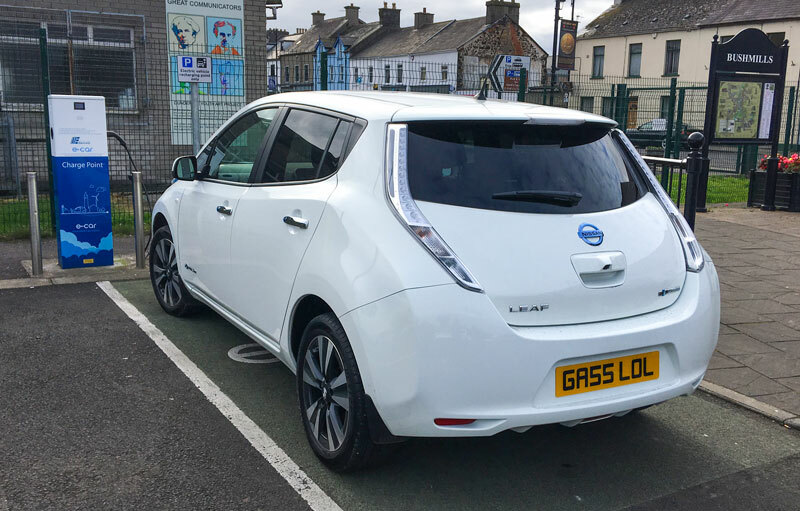 11 Comments on "Going Solar Part 3 – I Traded in my Range Rover for a Nissan Leaf"
Well timed article for me as we visited a Nissan dealer at the weekend and they are going to lend us a Leaf next weekend. Maybe it would be worth waiting until the new Leaf is out and more used ones come on the market? I though we’d buy a used Leaf too but in the end the deals were so good that we can drive a new Tekna for very little. Takes any worry about the residual value of a 5 or 6 year old Leaf at the end out of the equation too. I also visited a Nissan dealer a few weeks ago to try and book an extended test drive in a leaf, they couldn’t do one at a time that was convenient for us and now they won’t leave me alone. Sometimes ringing multiple times a day and resorting to calling from “number witheld” to try and get me to answer. It’s really put me off if I’m honest. Welcome to the world of EV driving! 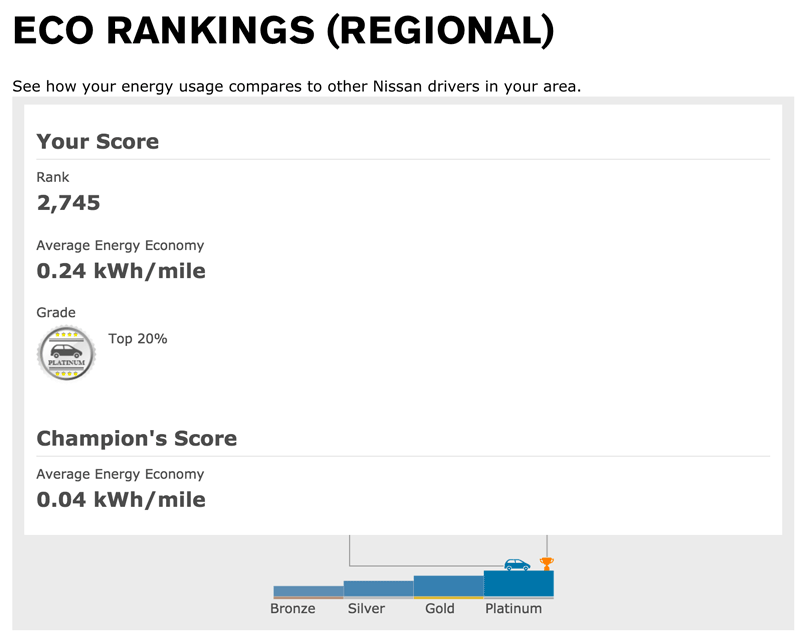 I’ve had a 24kWh Tekna for just over a year and can say I am a complete EV convert. 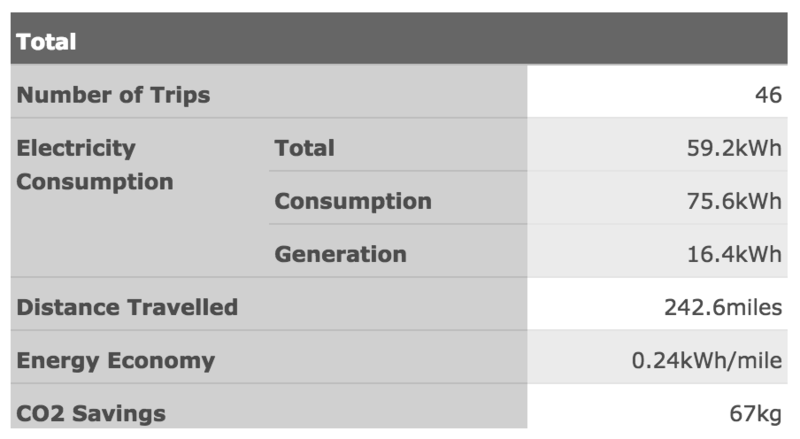 Thanks to the mandatory meter that has to be installed with the OLEV grant-assisted charger I can see that I spent £250 on electricity for the Leaf over 12 months covering 8000 miles, much less than I spent on petrol for the Fiat Punto it replaced. Servicing is also nice and cheap – £99 for the first year service. I chose to “rent” on very cheap 2 year PCP deal, so I’ve only got another 12 months until it gets handed back. The cheap PCP means the GFV amount is frankly ridiculously high, bit I’m not bothered as I saw it as 2 years low-cost motoring in a brand new car with all the toys! I’ll happily look for another deal when this one goes back and probably go for a 3 year PCP if the figures look good. In my case the Leaf is a second car – I still do too much mileage and need something much larger/more rugged for my daily work vehicle. I could have gone for an Mitsubishi Outlander PHEV, and following my Leaf experience I probably should have done, but I was not as confident about the technology as I am now. Hi, I also moved from a Range Rover to a Leaf. I had the 4.4 V8 petrol and sometimes put in £300 per week in petrol at 10-17mpg! I love my leaf and don’t miss the constant breakdowns, the Range Rover was returned to the dealership on a breakdown truck three times in one year. I’m saving enough money to bail & driving past the petrol station never gets old. The only downside to the leaf is the way other drivers perceive you, I never had drivers pulling out on me to tailgating the Range Rover. @SHL-Kelso & @Colin – thanks guys, good to hear. Great review Mark. Good level of detail from all aspects from purchase to operation. I went from an Audi A6 S Line to a LEAF and I haven’t looked back. Yes two very different cars and hard to compare but I enjoy the LEAF for torque, comfort, running costs and just pure silence! It all started when my wife’s Qashqai needed serviced and the dealer gave me a LEAF on overnight loan. Yes it’s not the most attractive but I did enjoy the experience. It’s comfortable and very spacious. It’s now the vehicle of choice for any trips that don’t need to pull a trailer or are longer ranger or time bound, for those we revert to the household ICE But it does feel a backward step! You are right about the sign up process and the software in general. They could take a leaf out of the Tesla book and offer software updates on the car interface. My 2015 GUI looks very dated now. My PCP deal is up in May and it will be interesting to see what choices I will have. I don’t really see a huge need for much longer range in my scenario. I would happily opt for another LEAF especially if I could get the same finance package. Just don’t get me started on ICEing or even worse Rapid Charger hogging by BEV’s or PHEV’s. Drivers should show etiquette! must say, am puzzled … savings sound good, but what about the cost of trading the old car for the new … and what about the cost of batteries … leasing the batteries is an option (at least on a Zoe) and would add 11 to 15p per mile to the cost, depending on mileage etc, and not taking the lease option would add a fair bit to the cost of buying the car, plus the cost of new batteries at some point – which would be all the sooner if do long drives & fast charges … hmm, puzzled ! Great! Thanks for sharing this information.